I have worked with Melinda on a number of websites but this was by far the biggest and most complex one so far. 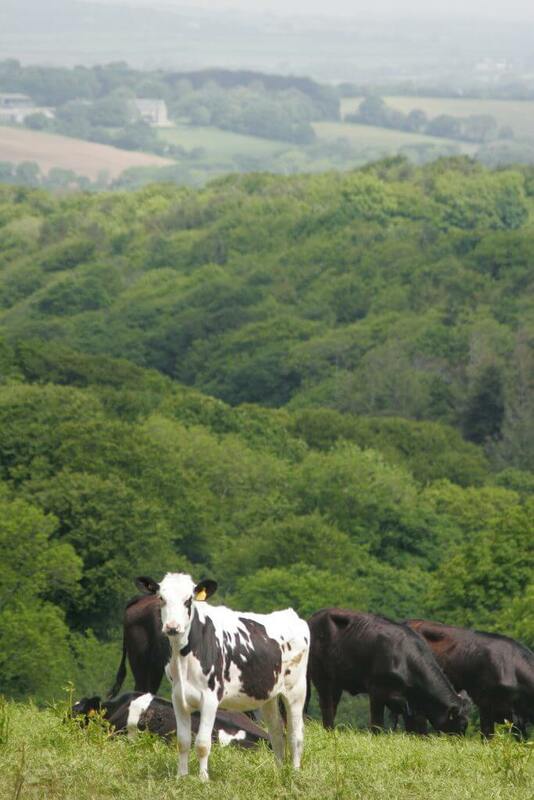 Trelowarren is a large family owned historic estate in Cornwall, UK and has numerous arms to its business – tourism, property, leisure and timeshare to name a few. To add to the complexity of the business came the added complexity of being in different timezones. As always, Melinda was a pleasure to work with, the design is beautiful and just what we were hoping for, the navigation and solutions to our own line business needs were well thought out and delivered and the timezone issue never once caused in problem (in fact maybe it made things easier). We love the outcome of this project and I would not work with anyone else on web builds! Melinda’s work is awesome. 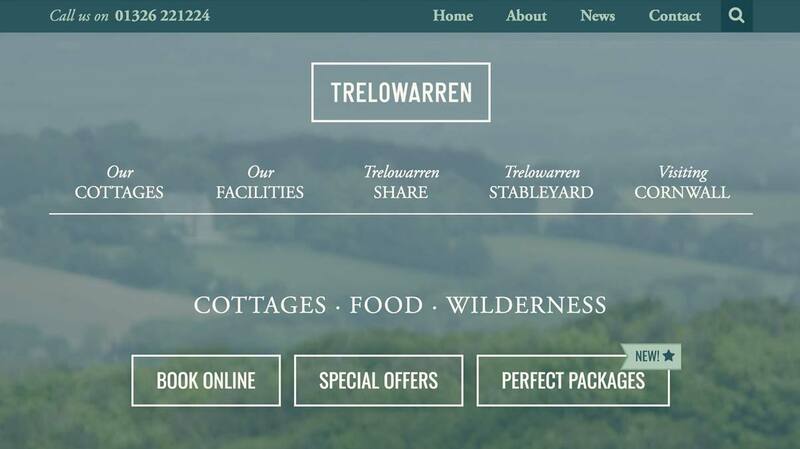 A favourite client of mine, Keren Cooksey (who I worked with on the Brisbane YogaSpace and Falmouth YogaSpace websites) approached me to bid for the Trelowarren website mid-2015 and I was, as ever, eager to work with her again. The existing Trelowarren website was content-rich but dated and needed to be brought into this century. The CMS was unmanageable and the client had many pain points regarding the ease of day-to-day management of the site as it was. They needed a site that would be easy for all age groups to navigate, given their target markets, and also be engaging and match the clean vibe of the newly-designed logo. Happily, I won the contract and after we agreed on the technical elements of the new website, we proceeded with design. There were some visual challenges – for example, how to manage the navigation menu – which was too large, I felt, to keep in a single row. Trelowarren loved the idea of splitting the menu in the design I proposed. 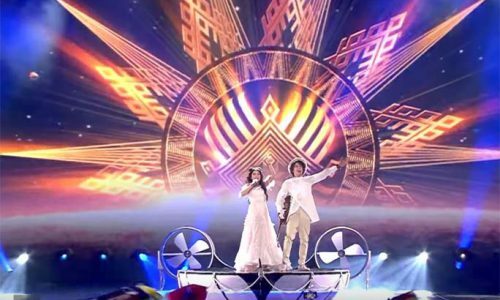 There were minimal changes and then the real fun began! 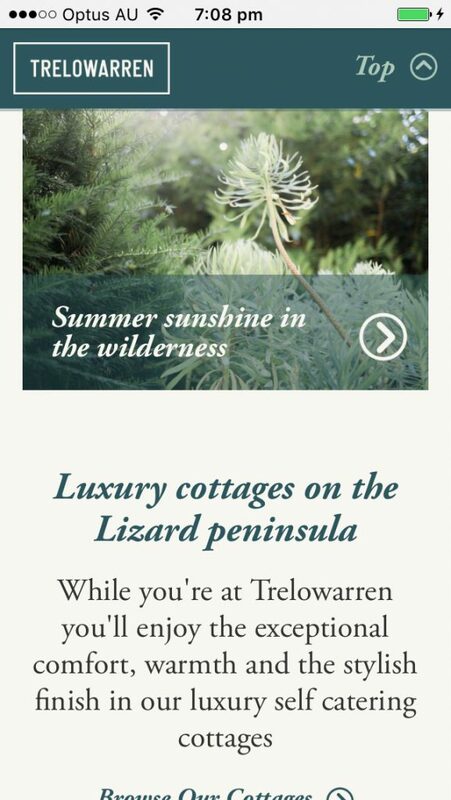 Development of the Trelowarren site has possibly been the most challenging but genuinely enjoyable coding jobs I’ve taken on; working out how to both make the content client-friendly and editable, and user-friendly on the front end. This site is heavily customised, using lots of custom post types and custom fields for greater control of all text and visual elements within the site. Being such a content-rich site I reasoned that it would be important for the client to not have to input information more than once, so there is a central control point for each content area, and the content entered is then dispersed where required throughout the site. 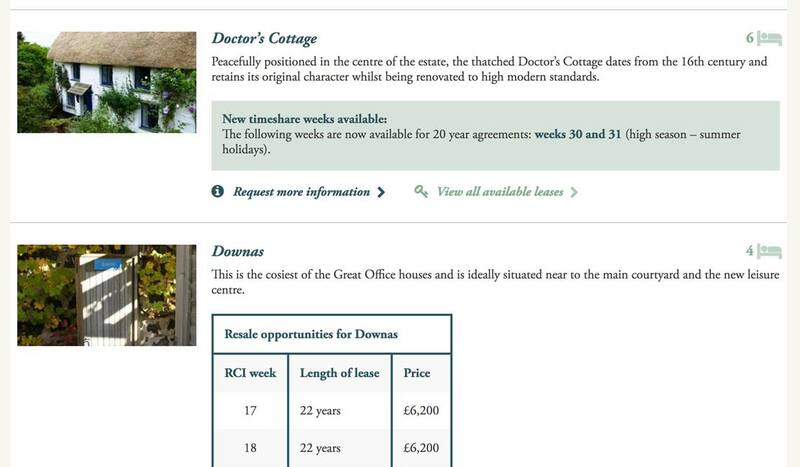 For example, all information pertaining to a single cottage is entered on the cottage’s individual page. That content is then automatically fed into and reused on the cottage’s parent category page, and on the cottage’s corresponding Timeshare information page (though there are fields within WordPress in the Timeshare section to allow for overwriting of this information on a case-by-case basis, if they wish). As another example; the client enters all of their guestbook reviews in the Reviews section that I custom made within WordPress (using custom post types and custom fields). They select which Cottage the review is for, and once the review is published, it not only appears on the main Guessbook page, but also in the Reviews section of the corresponding cottage page itself. I’m a big fan of not having to enter the same data more than once, and this site is testament to that! Each cottage page contains a lot of configurable information, and I’m pleased to say that the edit screens presented to the customer are consistent, easy to work within, and focus on what is important. Contact forms frequently appear at the bottom of cottage and timeshare pages, and are automatically generated, customised (programatically) to specifically refer to the particular page a user is on. There’s so many controls on this site to manage the content – easily – that I am finding it boggling trying to list it all. 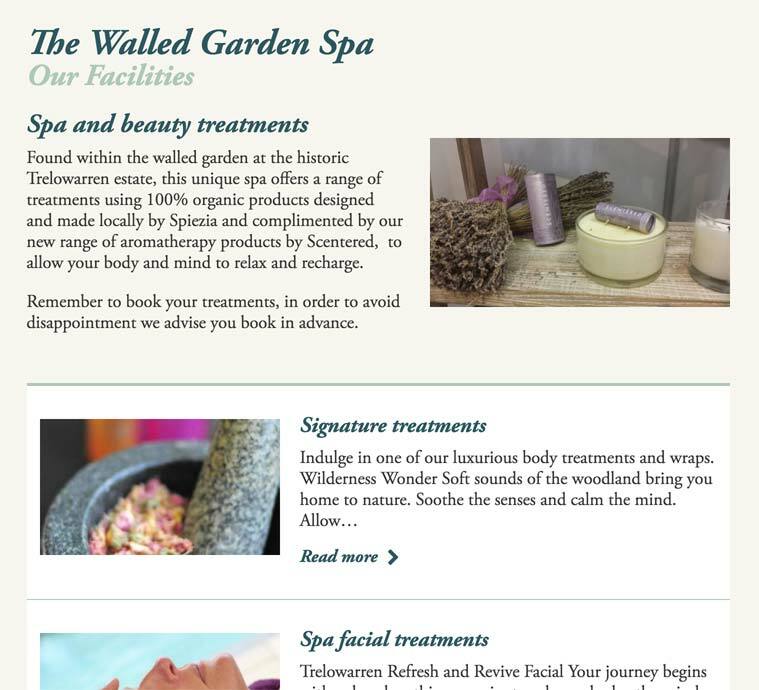 The client has the ability to create an unlimited number of ‘stories’ on the homepage – they can upload an image, set a title and description and a read more link, and when published it displays properly spaced out with the rest of the ‘stories’, automatically applying the parallax effect to the image they uploaded. There’s Facebook integration, a newsletter signup (that feeds signups to their pre-existing newsletter service), the ability to dynamically control the large-scale navigation menus (another custom post type) by ID, so that feature image, title and brief summary that appears in the drop-down automatically appears. So. Much. Control. I love this site, and happily, Trelowarren love it as well. It has been a complete success and I can’t wait to continue working with the people at Trelowarren in the future as their website continues to evolve. The Trelowarren website; perhaps my most highly customised Wordpress website yet. 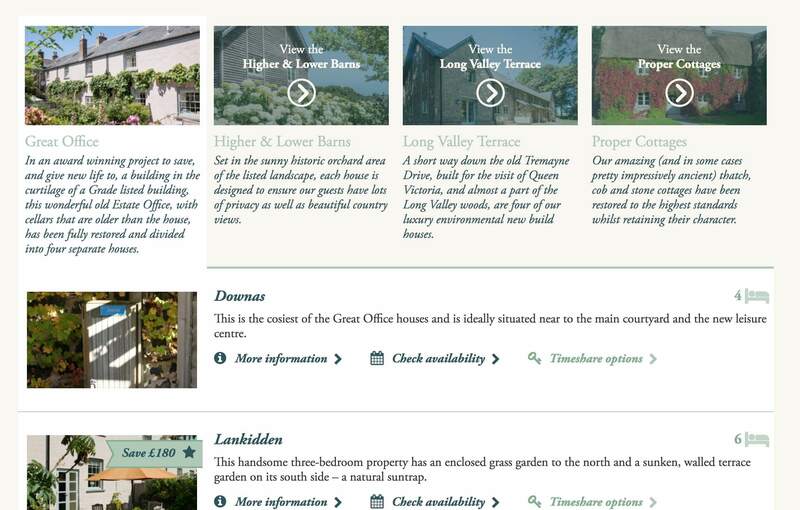 Cottages all listed on one page, without being overwhelming. Provides summary of each cottage, listing the at-a-glance important info about each. Fully responsive; this is a view of the homepage from a handheld device. 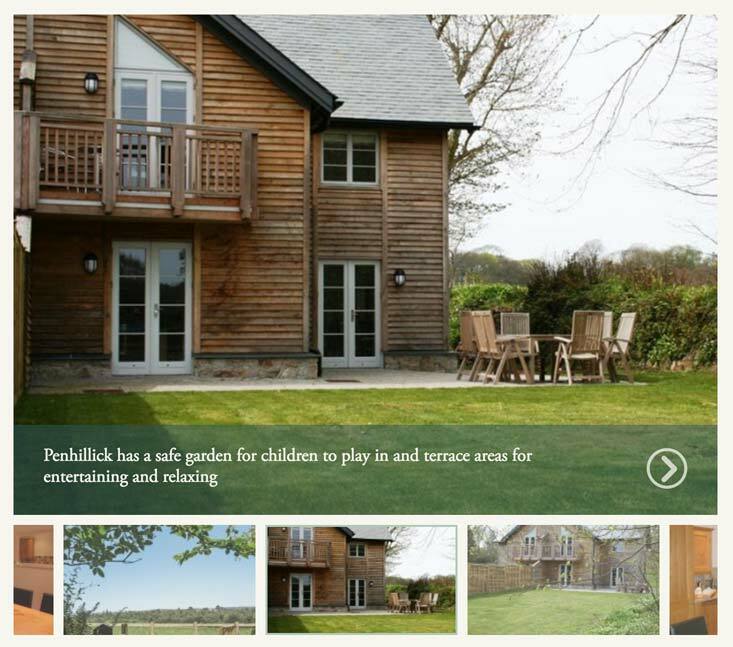 Each individual cottage page has an image gallery associated. 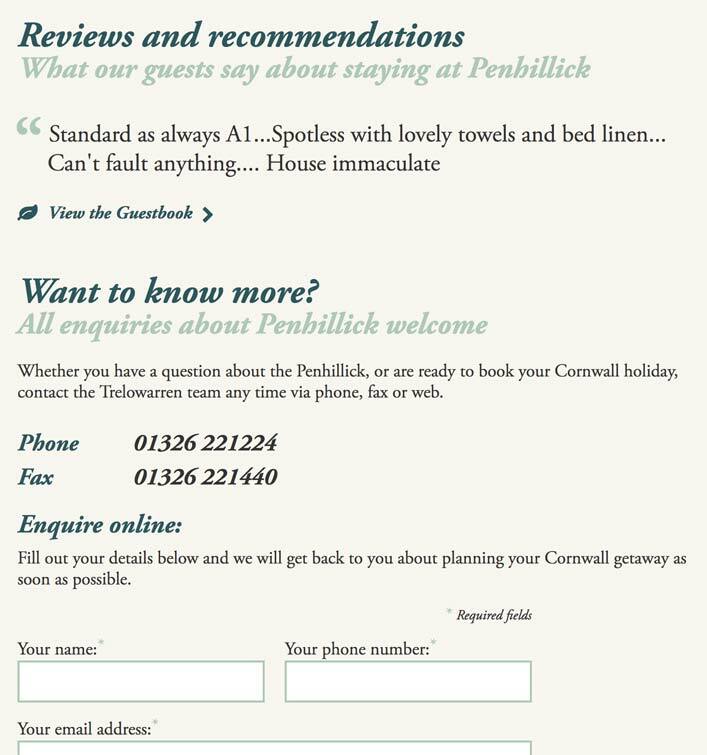 Reviews of the particular cottage are automatically fed through from the reviews page; enquiry form about each specific cottage on the page. Each cottage page has an extensive yet consisten features list in the sidebar and the ability to include special deals. 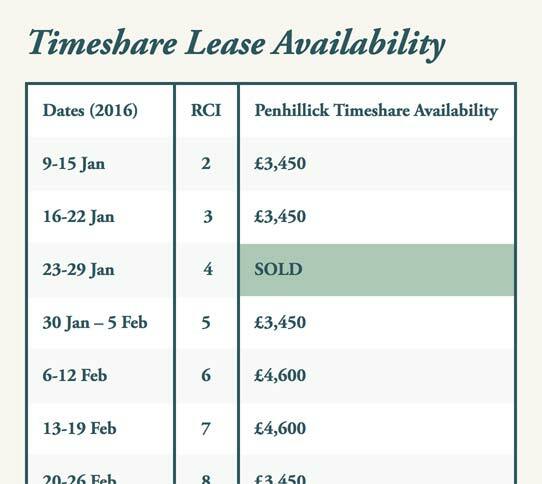 Timeshare lease table editable by the client. 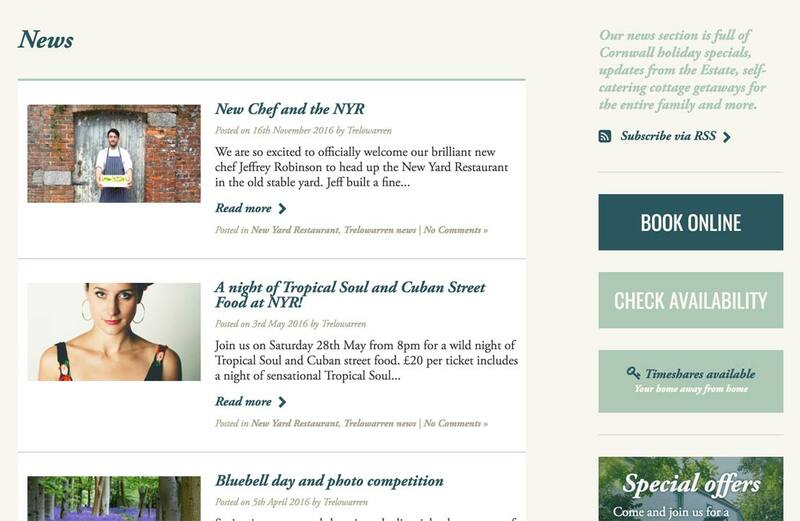 Trelowarren blog, full of Cornwall tourism info (and good for SEO). Category-type pages can be used anywhere within the site. Timeshare resale opportunities and specials have their own page, with the data mostly being automatically fed through from the cottage's timeshare page. Specific table rows/weeks/prices can be configured row by row, field by field, to ensure correct formatting.